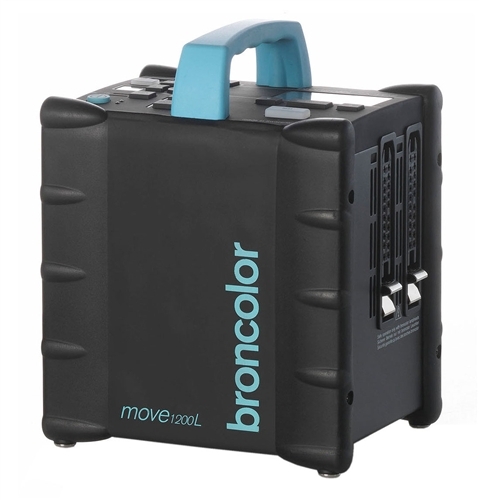 The Broncolor Move 1200 L Power Pack Outdoor Para Kit is built around the improved Move 1200 L battery powered pack. 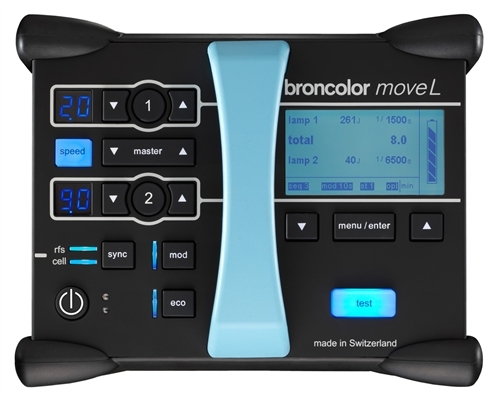 Broncolor continues to raise the bar that Broncolor itself has set so high as an industry leader. The familiar blue handle and modern design are about all that has remained from previous incarnations. Two outlets distribute 1,200W/s of flash power either symmetrically or asymmetrically over 9.0 full stops and is variable in either 1/10 stop or 1 stop increments. It gets it there fast too, in every photographic sense of the word. Recycling time is a super-fast 0.02 to 0.9 sec. (min/max) with action-stopping flash durations of 1/1,000 / 1/350 sec (t0.5 /t0.1) at full power and as short as 1/20,000 / 1/8,500 at minimum power. That means fleeting gestures and water droplets among other subjects frozen in mid air if desired. It's great for sports and dance in the field as well. At only 13.7 lb it's lighter that its predecessor and uses an Li-FePo4 Lithium battery that gives you up to 230 full power flashes at full power and up to 50,000 pops at minimum power. You can even run the modeling light on your selected head for up to 2.0 hours thanks to the inclusion of a Continuous Light Adapter. You won't wear out this battery anytime soon either: it's rated for 4,000 recharge cycles. The Move clocks in at an ideal 5500K color temperature, maintained by proprietary Enhanced Color Temperature Control technology. With quality like this, tripping over sync cords is just not an option; The Move 1200 L's triggering options include optical, IR and radio slaves built into the unit. The Move has a radio range of at least 164' and depending on the circumstances, a possible 984'. 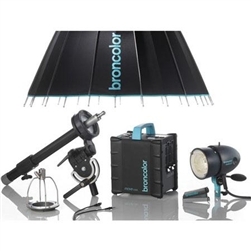 The kit's Broncolor MobiLED Lamp Head has a 1,600W/s rating and a unique 30W LED modeling lamp which outputs the equivalent of 100W of tungsten light but at a perfect 5,500K. The head features temperature activated fan cooling to increase the life of the flash tube and modeling light. Multi-tasking photographers can take advantage of the Move's continuous light feature to use the modeling light on its own for video productions. The head's innovative design allows you to reverse its protective cap and use it as an umbrella reflector. A built in Broncolor bayonet mount enables use of the comprehensive array of Broncolor light shapers and accessories. The MobiLED is compatible with The Move 1200 L, A2L and A2R packs with the modeling light functioning and all other Bron packs without the LED modeling light functioning. Rounding out the kit is the 34" Para 88 FB Reflector with Pulso Focusing Rod. It's built like an umbrella with 24 braces and specular silver coating on the inside. The precise front-focusing device is optimized for operation with Pulso G, Unilite, Litos, MobiLED, Pulso Twin and Pulso 8 and PulsoF2/F4 flash heads. It may also be used with the Broncolor F200/F400/F575 daylight lamp heads as well as Kobold DW200 and DW400 HMI heads. The Primo flash head may also be used with restrictions. The design of the Para 88 FB yields very high light efficiency, wrapping the subject in brilliant light which emphasizes detail. Due to the calculated parabolic form of the reflector, light fall-off only occurs at the Para's extreme edge. The base Para 88 FB system consists of the Para 88 FB reflector with a bracket to mount Pulso-type lamp heads facing forward. This version of the Para 88 FB is complete with a focusing rod which allows mounting of a Pulso head in a rear-facing position for a softer effect. The kit comes complete with the Move 1200 L pack, battery, power cord and charger, as well as the MobiLED lamp head with a Continuous Light Adapter and the Para 88 with a Pulso adapter for the MobiLED.